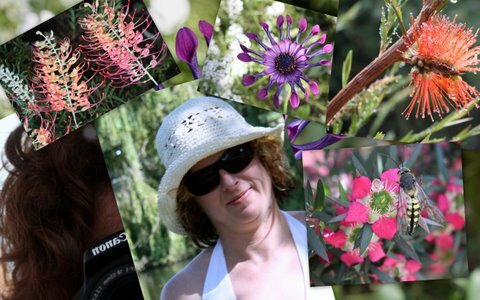 Cubby House Crafts: This Weeks Snappyfriends Challenge...Self! This weeks snappyfriends challenge is 'self'. I have been worried all week about how I would go about it as I'm not very comfortable having my pic taken and was putting it off...waiting maybe for that good hair day lol! So decided today was the day to just 'do it'. So you can see a snippet of me in the corner taking a pic of myself in the mirror...and the other my daughter(8) took back in January. Nearly the end of the week already...I have completed 3 small Anni Downs stitcheries, from her new book, and hope to make them up on the weekend. You look damn good to me. If I looked that good I would have that enlarged,full screen. Sounds like you have been very busy with the stitcheries. You might have inspired me to do it! Okay, let me change the subject, I'm having a giveaway!!!! Hmmm... bad hair days eh? Oh thank goodness for the invention of hair bands, that's what I say!! !